Why is your bud counter where it is? How come your T-shirts and pipes are over there? And what’s up with your lobby area? Chances are that the layout of your store has evolved over time. Maybe you’ve had to work around a constrained floorplan, and you’re constantly trying to come up with a better flow for your patients and customers. 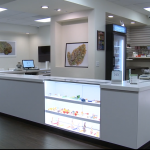 Every dispensary and rec store’s layout is different, but it shouldn’t be haphazard. Whether you’re designing the space for a new store or trying to dial in a long-time location, the layout of your store should have one guiding principle: to make a patient’s or customer’s visit simple, comfortable and memorable. Let’s take a walk through a virtual store and consider issues and best practices for helping you achieve a great customer experience. Access: Starting with parking and access, you will want to offer handicap parking and, in most cases, wheelchair access. Using security cameras from the car to the cash register will make safety a priority. Lobby: Keep your lobby straightforward and comfortable while offering space for all who need privacy to fill out paperwork or wait their turn. Offering teas, coffee and snacks in the lobby can make waiting seem more personalized, especially if it is taking a little longer than normal. There can also be an area in the lobby to leave reading materials, so patients can stay up-to-date on local and state laws, or to sign petitions. Patients should complete intake paperwork in the waiting room and present it to the staff before the initial visit. A simple intake sheet gives workers access to pertinent information before the patient has been brought into the dispensary room. Dispensary area: From the lobby to the medicine and product areas, the flow should be natural and visually stimulating. Keeping flower toward the back encourages the patient to walk the entire length of the store and browse on the way in and out. You should separate flower into Indica, Sativa, Hybrid and CBD. Some states require the packages be sealed so that they can’t be opened and inspected. 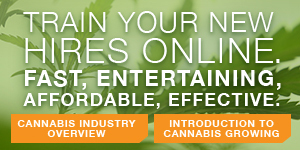 Others allow for cannabis in jars that can be examined, smelled and viewed with lighted magnifiers. The area around your flower station is an ideal place to keep concentrates, tinctures, tablets and skin patches. Test results should always be near the products they represent. Other than past personal results, a patient’s top reasons for purchase are usually price point and test results. Food, drinks and candies: The coolers, fridges and shelves that contain food, drinks and candies should be near the checkout area if possible. Keeping these items near the final stop in the visit creates opportunities for impulse purchases. The varieties of food and drink products grow each day, so positioning them near your register will enable your staff to “up-sell” and show off new products. Glassware, T-shirts, and related items: If you choose to offer papers, pipes, bongs, dab rigs, vaporizers or oil pens, you may want to put them on the other side of the register area away from the checkout flow. This area can be another glass case with visible shelves for browsing. This glass and clothing viewing area should be out of the way of the flower wall, packaged food sections and checkout area. Customers who are looking at glass pipes, bongs and clothing may take a little more time browsing and deciding what they want. 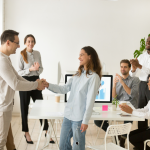 To maximize flow and give potential these customers space and time needed to make their choices, this area of your sales floor can be separate from the rest. Private consultation area: There are times when you need a private consultation with a patient. This area can be as simple as placing a few chairs out of the way of the sales floor or having a separate office, depending on the size of your total space. Office: The cannabis industry is nothing if not paperwork-intensive. It’s tempting to skip the space for an office in favor of a desk in the corner, but avoid this temptation if at all possible. A modest office space helps you to deal with confidential matters in private, as well as provide a place to keep your safe and security system. By the way, the best practice for your video security system is to lock the recording part in the safe at night. Your office area also can be used for taking in, weighing and recording new cannabis products, as well as a place to have meetings with vendors and interviews with job candidates. But whether you’re planning a new store or tweaking your current establishment, keep one thing in mind: the customer.